Fr. Raymund Snyder, O.P., introduces the Dominican Friars in the first segment of Saint Benedict Press’s forthcoming RCIA program, CREDO. The Thomistic Institute has partnered with Saint Benedict Press to produce a program to help parishes strengthen RCIA and adult education initiatives. The program, which is called “Credo,” summarizes the Catholic faith in 36 lessons. Each lesson includes a book chapter, discussion questions, a short teaching video from a friar, and a personal witness video from converts to Catholicism. Fr. Thomas Joseph White, O.P., Fr. Dominic Legge, O.P., Fr. Gregory Maria Pine, O.P., and Fr. Raymund Snyder, O.P. 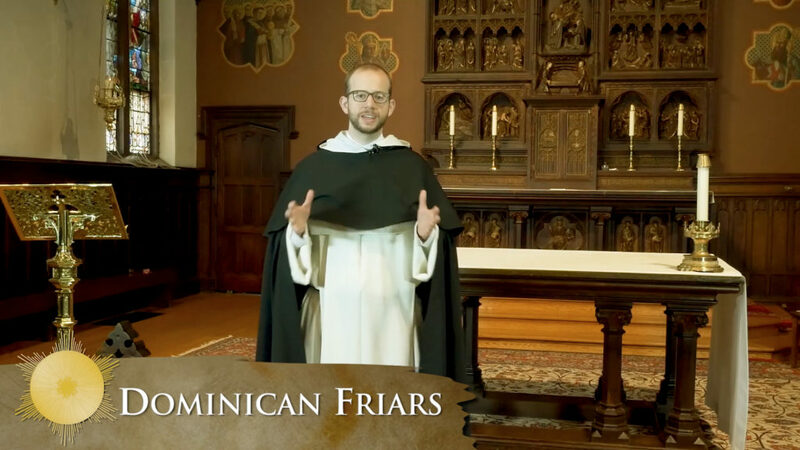 – all friars involved in the Thomistic Institute – appear in the videos, which were recorded in the chapel of the Dominican House of Studies in Washington, DC. Fr. Aquinas Guilbeau, O.P., prior of the Dominican House of Studies and assistant professor of moral theology, contributed to the accompanying participant guide. Credo weaves in teachings on prayer from the beginning in order to introduce participants to the Church’s life of prayer. “In each chapter, there’s the opening prayer, which has been composed by the friar presenting as well as a rich assortment of traditional Catholic devotional prayers” Fr. Snyder says. Credo does not shy away from the Church’s moral teaching. “We’re very aware that we’re producing this program in 2018. The issues that are often difficult for people today are treated thoroughly and repeatedly. We don’t, for example, wait until the very end to talk about sexual morality,’” Fr. Snyder says. In keeping with the Thomistic tradition, the program organizes the section on morality on the basis of the theological and natural virtues. Teachings on grace are present throughout the course.